First Line: This book profiles the lives of ten courageous women from the mid-1800s through the turn of the century. This award-winning book is a perfect introduction to ten women about whom you'll want to learn even more. The ten profiled are: Jessie Benton Frémont, wife of a presidential candidate who once said of herself "I am like a deep ship. I drive best under a strong wind"; Abigail Scott Duniway, "the Grand Old Lady of Oregon" who-- with a sixth-grade education-- became a noted journalist and suffragist and the first woman to register to vote in the state of Oregon; Sarah Winnemucca, the passionate voice of the Paiute Indians; Fanny Stenhouse and Ann Eliza Young who fought against the tyranny of polygamy; Belle Starr, one of the best known outlaws of her day; Nellie Cashman, known as the "Irish Angel of Mercy" in mining camps from Arizona to Alaska; Jeanne Elizabeth Wier, Nevada's noted historian; Helen Jane Wiser Stewart, the First Lady of southern Nevada whose ranch just so happened to be called Las Vegas; and Grace Carpenter Hudson, one of the most accomplished Western artists in America. Nellie Cashman, a compassionate woman with a zest for life who was still mushing (running behind a dog sled) when she was seventy years old. While she lived in Tombstone, Arizona, she had a restaurant where she served such folks as Wyatt Earp, Doc Holliday, and Pat Garrett. Jeanne Elizabeth Wier, a woman who underwent severe hardship traveling from one dusty settlement to another in a never-ending quest to save the documented history of Nevada. Grace Carpenter Hudson, who captured the beauty of the Pomo Indians while her husband recorded their customs and language. Between the two of them, they preserved the heritage of a culture for all time. If you love the history of the American West, if you love women's history, you're going to enjoy this book. All the women featured in it deserve to be well known. 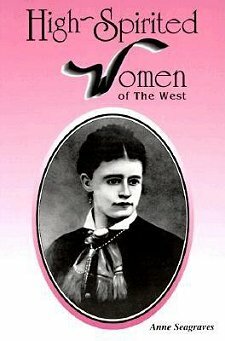 High-Spirited Women of the West at Amazon. High-Spirited Women of the West at Alibris. High-Spirited Women of the West at Your Favorite Indie Bookseller.